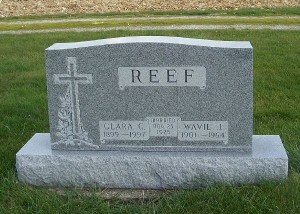 This is the tombstone of Wavil J. and Clara C. Reef. The grave marker is located in row 10 of Zion Lutheran Cemetery, Chattanooga, Mercer County, Ohio. The inscription is: REEF, Clara C., 1899-1997, Wavil J., 1901-1964, Married Nov 25, 1925. Clara was the youngest child of Jacob and Christine (Rueck) Miller. 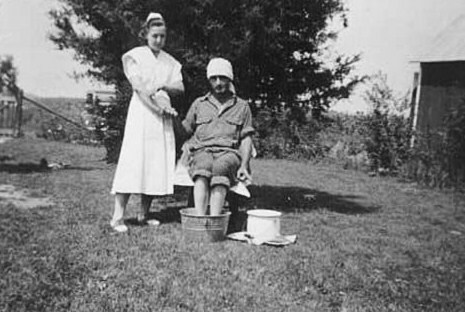 She was born 4 December 1899 in Blackcreek Township, Mercer County, Ohio. She was baptized at Zion Lutheran Church, Chattanooga, on 2 January 1900 and was christened Klara Ida Müller, according to Zion’s records. She grew up on the Miller farm on Sipe Road and she was my great-aunt. She died 17 February 1997 in Mercer County. Wavil J. “Johnny” Reef was born 13 June 1901 near Bryant in Jay County, Indiana. He was the son of Oliver and Margaret (Whitney) Reef. He died 6 June 1964 in Mercer County. Johnny and Clara married 24 November 1925 at Zion, Chattanooga. W.J. Reef Passes Away—Wavel [sic] Jennings (John) Reef, 62, died suddenly Saturday evening at his home near Chattanooga. Although he had been in failing health since last March, his death was the result of a heart attack. He was a farmer and an electrician but had been unable to work since March. He was a member of Zion Lutheran Church at Chattanooga. Born June 13, 1901, near Bryant, Ind., his parents were the late Oliver and Margaret Whitney Reef. He was married in Mercer County 38 years ago to Clara Miller and she survives with one daughter, Mrs. I.D. (Cynthia) Hileman, R. 1, Willshire, two grandchildren, a brother, Harley Reef, Toledo, and two sisters, Mrs. Frank Copic, Toledo, and Mrs. Curney Lindsey, New Corydon, Ind. 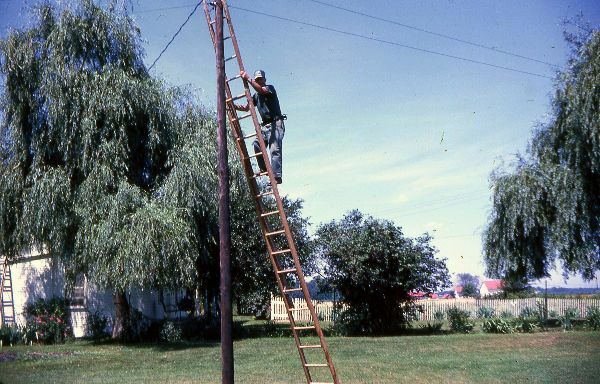 Johnny Reef wiring a night light on the Miller farm. Clara Reef—Clara Reef, 97, Shane Hill Nursing Home, died there at 2:50 a.m. Monday. 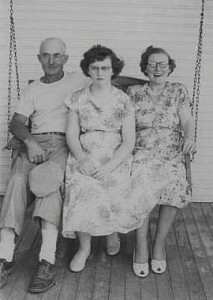 She was born Dec. 4, 1899, in Mercer County, to Jacob and Christina (Rueck) Miller. In November 1925 she married Wavil “Johnny” Reef, who preceded her in death. Survivors are a daughter, Cynthia Hileman, Decatur, Ind., and three grandchildren. She was preceded in death by three brothers, three sisters, a half-brother and a half-sister. She was a homemaker and member of Zion Evangelical Lutheran Church, Chattanooga. I remember Johnny and Clara very well. They lived just down the road from where I grew up. When I was very little I used to run down to their house to see their daughter Cindy. 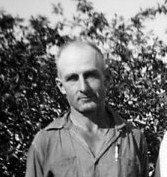 Johnny was the local electrician and he and my dad wired a lot of homes and barns in the area and put up many night lights. Johnny was quite a kidder and jokester. I remember that he would always give a chamber pot to a newly wedded couple as a wedding gift. At their wedding reception the couple would take the lid off the pot and blush and laugh at whatever was inside the pot. I wasn’t allowed to take a peek at what was inside because I guess I was too young. But I was always curious about the pot’s contents. I imagine it contained something like corn cobs. Hopefully nothing worse! Johnny Reef & his niece Ruth joking around. What I remember most about Clara were her cats. She had a lot of cats. There were cats of all colors, sizes and ages in the house as well as in the barnyard. Every stray cat in the area must have known they could take shelter at the Reef farm. Johnny, Cindy & Clara on the Miller porch swing. 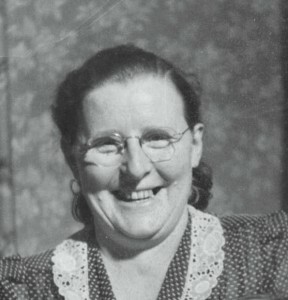 Clara’s mother, Christine (Rueck) Miller, stayed with the Reefs from about 1929 until she died in 1945. After Clara passed away Cindy gave me a stack of letters written to Christine from her family that had moved out west. Unfortunately, most of those letters were written in the old German script. I can read some German script in church records but I don’t know enough German to read whole letters. Maybe someday I will get them translated. However, a few of the letters were written in English and I was able to get some information from them. Thank you for another outstanding article. I remember Clara and Johnny well. I never knew Johnny’s first name until now. I guess I have never visited the gravesite. The first things that come to my mind about them are what you mentioned in the article, Johnny’s chamber pot wedding gifts and Clara’s cats.